By last year, they had a performance of samurai (warrior in the Middle Ages) before or after the game of "Ningen Shogi". But this year, they performed before a latter half of a game, after the "Wadaiko Gassen" (battle of Japanese drums). There was a change about contents, too. Previous contents was a fight between Japanese ninjas. 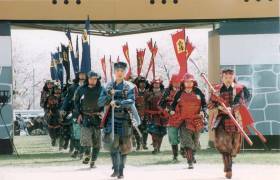 This year, they reproduced a battle of Nobunaga ODA who is a famous samurai in the Middle Ages and explained a change of tactics by a gun party. I thought that it was very enjoy until now. But there was a point to be worried about. 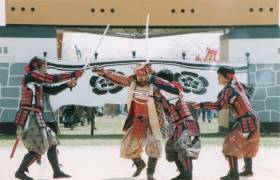 There will be circumstances of preparations, too, I think that an atmosphere of the Midle Ages does not fail if they hold an entrance of samurai just after the performance. Furthermore, I wanted them to use spirit about a background music of the meantime. I think that background music of historical drama style is good, but I feel a parody music of Tatsuo KAMON too out of place. I thought it becomes a more splendid event if the "Ningen Shogi" becomes the event that to appeal for not only eye but also all the five senses. Previous "Appearance" <Please choose...> Next "My Impression"